One more off the Wait List for My Hope Chest ~ New Beginnings! Dr. Antonio Gayoso and his butterfly in waiting! Makesha’s testimonial…. The day before her surgery!! 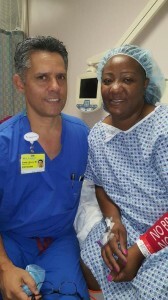 “Oh My God…I me excited nervous at the same… I dreamed of this day ever since they took my breast away. I’ve never been able to afford it. You guys were my DREAM come true–you are my Angels! You and Doctor Gayoso are changing my life right now! Before this surgery I had low self esteem… I didn’t feel complete… you guys are making me complete. Thank you thank you!! I thank you from the bottom of my heart. Why does Oprah Like My Hope Chest? There is BIG NEWS at the My Hope Chest camp! Things are moving UP for My Hope Chest in a very big way. 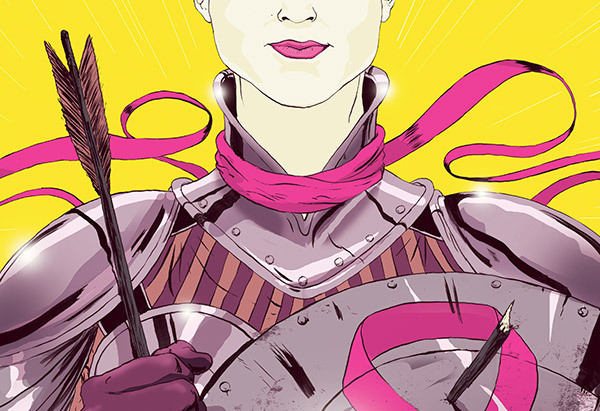 In the October, 2012, issue of “O” The Oprah Magazine, My Hope Chest Founder, Alisa Savoretti is honored in their “Breast Cancer Heroes” section … Read below for yourself! Meet three spectacular women who are making a difference in ways as unique as they are. Breast Reconstruction Awareness Day! Oct 17th! The American Society of Plastic Surgeons has declared a day at last to bring light to breast reconstruction, the need for presenting options to newly diagnosed. My Hope Chest calls October Breast Cancer Action month and believes now is the time to put our money and attention in the area where dollars make a definitive deference. 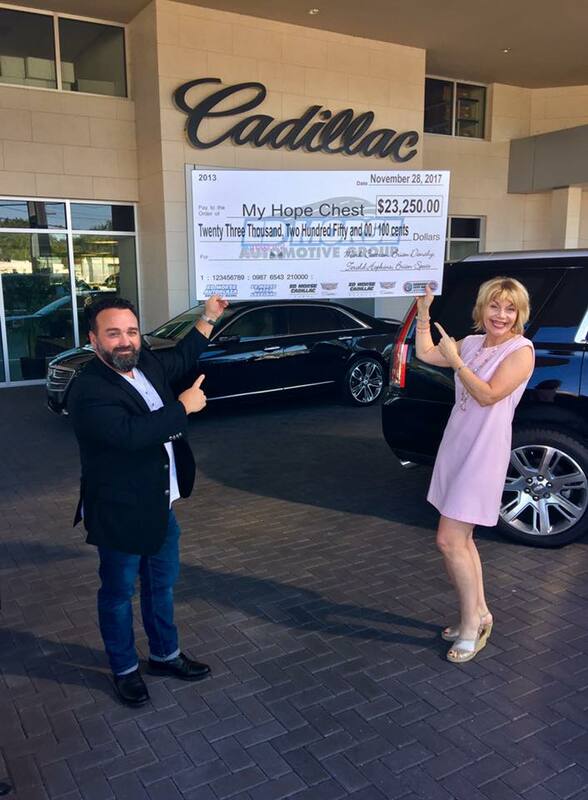 This new day, bradayusa.org, offers MHC “HOPE”…. we will have another funding resource to server our wait list of women nationally and in addition to recruiting more surgeons within the ASPS to partner with us and facilitate this mission. Breast reconstruction is the “Final step of breast cancer treatment” for those who desire, and is covered by insurance. 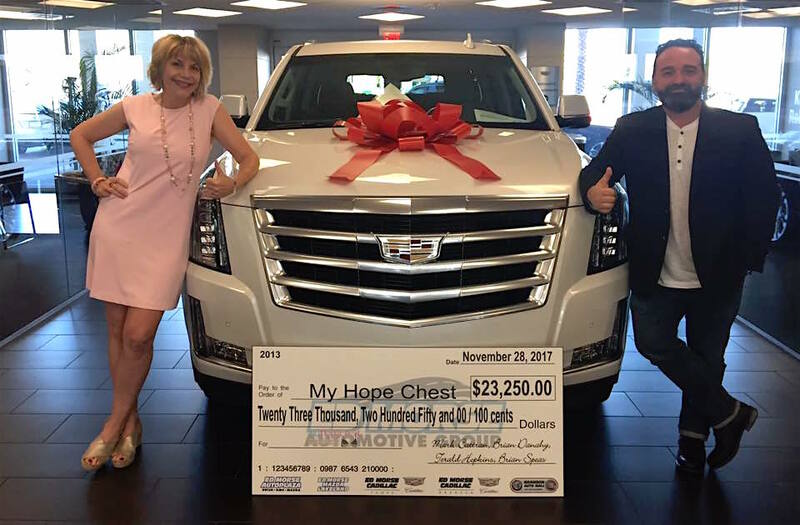 My Hope Chest helps uninsured survivors and now even corporate America is coming to us with the need to meet their “co-pays.” We proudly support BraDayUSA and encourage you and yours to host a “Hope Floats” event on our behalf next year! Details to come….SAVE THE DATE! Always a happy day when My Hope Chest sends a women for surgery. It was an exceptionally happy week for our grassroots organization when Laurie Gilsdorf of Florida and Ellen Garber of New Mexico both started their reconstruction process the same week. My Hope Chest is proud to work with Doctor of Distinction, Dr. Antonio Gayoso of Gayoso Plastic Surgery in St. Petersburg and the surgical team of doctors in New Orleans at The Center for Restorative Breast Surgery to facilitate these dreams come true. Your continued support enables My Hope Chest to continue its mission as the payment facilitator for breast reconstruction surgeries for uninsured and under insured survivors. 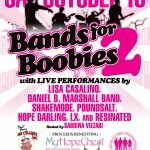 SATURDAY MUSIC FEST FOR B00Bies ~ SAVE THE DATE! Spend an AWESOME DAY listening to great local musicians and supporting our fabulous cause. WHAT: A full spectrum of amazing Musical Guests from jazz to rock!! Great Raffles prizes – Over $3,500.00 in prizes – and 50/50 to win some cash! Insurance covers breast reconstruction… My Hope Chest efforts focus on the total healing of body, mind and dignity of the UNINSURED breast cancer survivor. THE SHOW: An AMAZING Line up this year with a full spectrum of music catering to the tastes of every generation!!! Originally from Long Island, NY, Lisa Casalino has been performing in Central FL since 1998. Based in Tampa, FL, she’s one of the most sought-after singers here. With musical talent so versatile, gorgeous looks, and a lively spirit to boot –it’s a given you’ll find her performing at the finest attractions in the Bay area … and beyond. Daniel B. Marshall, a refreshing artist hailing from Tampa, FL, is the face of what music is and always will be. He’s a singer who writes his own songs, plays multiple instruments, is in need of zero studio gimmicks or computer tricks to make his music interesting, and performs as often and fervently as possible. He has toured the world as a guitar player (Nick Carter, Ashley Gearing), recorded with top-notch producers (Danny Rader, Shelly Yakus), and performed on television and radio stations across the country in addition to playing over 260 shows each year. Drawing from the folk, rock, and country acts from his mother’s vinyl collection such as James Taylor, CCR, and Bill Withers, his own brand of music reflects a deep love of carefully crafted lyrics and melody. Daniel B. is the kind of musician that proves what we all know: if you dream big and work passionately, you will have success and reach the top. SHAKEMODE plays contemporary and classic hits with their own indie pop swag. With a wide variety ranging from classics, to radio hits, to club bangers, SHAKEMODE is bringing the heat to Florida’s entertainment scene. See what the Tampa Bay Times calls “A cut above much of the beach rock you might expect to find…” . poundSalt is a Hard Funk band quickly solidifying itself as one of the premiere live acts around with their high octane shows. Download their first single “WINDOW” on any major digital site through Rising Sun Music. Hope Darling is an alternative/modern rock band based in the Tampa Bay area. Named after a dearly departed friend, Hope Darling is a band comprised of friends and family brought together by their shared love of music. With musical tastes and backgrounds ranging from classical to blues to rock to reggae and hip-hop, Hope Darling combines the very best of alternative and modern rock while entertaining and captivating audiences with their sincerity and drive. LX is no stranger to the music scene having started his musical career at the tender age of 7 years old, touring throughout the southeast region with his siblings. LX has a growing following world-wide because of his energizing, soulful and entertaining performances. LX’s polished lyrical styling and dynamic energy transcends multiple ethnicities and ages everywhere he performs. LX, as lead vocalist for his brothers group, A7, won the hearts of thousands across the country with the single, “Don’t Walk Away,” which earn the band 29 Consecutive weeks on Billboard Charts top 20, top 10 on R&R, and top 30 Media Guide Charts. LX says, “This was an exciting time for me, because my voice was on the radio, a song I wrote along with my brother, Zo and good buddy, John – this was something we’ve always wanted to hear – it was an amazing time for all of us.” LX did not only hear his voice on the radio, but saw his interviews being covered in major press, such as Ebony and others. Resinated is an up and coming, hardworking five piece Rock/Reggae outfit that consists of harmonic melodies drawn together through brass and string instruments. Resinated has been together for less than a year and has proven that they are worthy for any stage in any town! Kenny Mullins (vocals, composer and guitarist) created Resinated to be a “Unity” of art, music, and water culture. Hailing from the beaches of Florida, Kenny met John Gray (Lead Guitars and composer) on a skim board in Indian Rocks Beach. Since then they have been shredding all over the coast. Josh Hasak (percussion) and Justin Runfola (bass, artist for band) soon joined after connecting with John and Kenny one night at a gig, and soon after came Cameron Willinger (trumpet and trombone) to add a finishing ingredient to the bands flavor. Together they have played venues such as: Jannus Live, State Theatre, Local 662, Red Mesa Cantina, Venue, Vintage, Brass Mug and many more! They have shared the stage with bands such as: Iration, Stephen Marley, Anberlin, Suenalo, Fayuca, Geri x, Burning Tree, Fiction 20 Down, Authority zero and also have played numerous of charities! Resinated release their first album “Unity” only three months after playing together. They are currently working on their new full- length album due in mid-winter. This album will be the beginning of a long road these guys plan on covering! • 8:11 pm – 8:25 pm (15 minutes) Sabrina Vizzari – Closing, Thank you etc. Having the right attorney on your side is vital when faced with legal issues affecting you, your family, and your business. Contact our office. HLG is delighted to represent you zealously and serve you and your legal needs! Jani Roberts, International Zumba Education Specialist (ZES) and owner of the Wellness Company, and Diane Petoskey, renowned nutritionist, unite with Zumba Fitness entire ZES Team for this one day wellness event! Diane Petoskey will present “Building a Healthy Immune System” followed by a light lunch and an evening Zumba fitness Master Class. The “Creating Butterflies™” program is a national program designed to inspire and promote a healthy quality of life on the road to recovery after cancer and breast reconstruction. This health and wellness event focuses on the total healing and well being of those with, or who have survived a health related issue and individuals interested in improving their general quality of life. Make it a weekend getaway… Hotel Package for a special group rate at the Doubletree – Details coming soon! 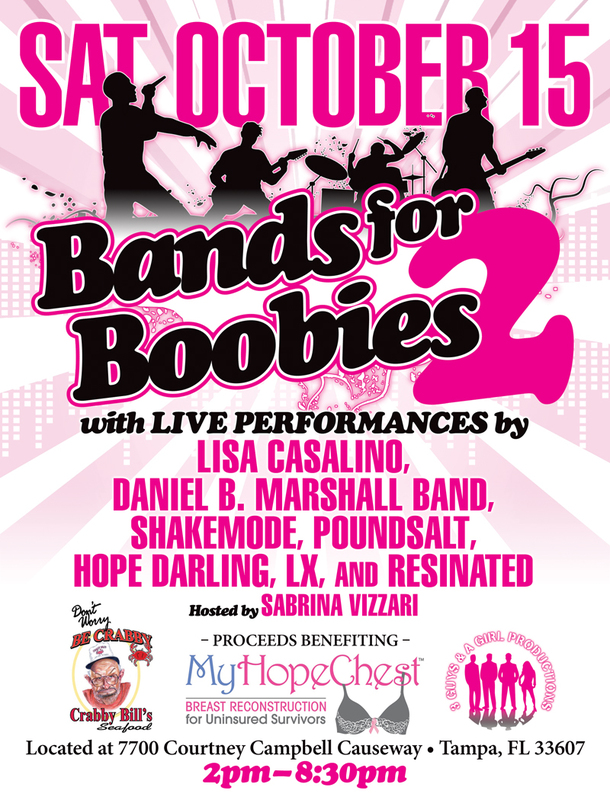 Angel volunteer “Sabrina” has pulled together a concert event at the legendary Skipper’s Smokehouse with proceeds benefiting My Hope Chest! 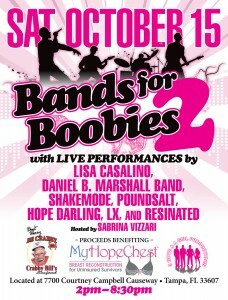 CONTACT: Sabrina Vizzari at 813-857-6178 or email ILoveBoobiesCF@gmail.com if you would like to volunteer for the event! Show your support with your “Hope” or “I Love Boobies” T-shirt and/or Koozie – available through Sabrina and also at Classy Consignments: 23020 SR 54, Lutz, FL. Be a party of the Inaugural BOOBIE PALOOZA!!! Please invite friends, tell them about the amazing music and help us spread the word! Women’s Thermal Underwear has teamed up with us this October! The online shopping portal specializing in thermal layers for women will donate 50% of its gross commissions from each sale made through womensthermalunderwear.com during the month of October 2010, to My Hope Chest. Just visit womensthermalunderwear.com between October 1, 2010 and October 31,2010 to shop for your thermal underwear, base layers, or great gifts. You can compare prices from multiple online stores, find what you want for the lowest price, and when you complete a purchase with the associated online retailer, that retailer will send a commission payment to Women’s Thermal Underwear. At the end of October, 50% of the total commissions from the month will be donated directly to My Hope Chest. Women’s Thermal Underwear is part of The Breast Alliance. You can learn more here.